Although the recent breathtaking demonstrations from Jordan to Yemen were a sign of dramatic revolutionary change, Karma Nabulsi says life in occupied Palestine appears much the same. A fellow of St Edmund Hall, Oxford and tutor in politics, Nabulsi is one of 15 contributors to Seeking Palestine, a collection of new Palestinian writing on exile and home edited by Penny Johnson and Raja Shehadeh. In her chapter Exiled from Revolution, Nabulsi laments ‘the fragmentation of the body politic’ where Palestinian leadership no longer involves itself in the ideas and practice of liberation but instead is focussed on business deals. She protests the unbridgeable chasm existing between ‘Gaza and the West Bank, Hamas and Fatah, and between Palestinians inside Palestine and the millions of refugees outside of it’. The former representative of the Palestinian Liberation Organisation (PLO) writes that ‘the awesome West watches mesmerised’ as Arabs ‘create and celebrate their revolutions’. Some Palestinians believe that the revolutionary spirit died after the 1982 Israeli invasion of Lebanon, but everyone agrees that it was well over by 1991 and that Palestine is now ‘at a collective nadir in a long history of resistance.’ Nabulsi hopes the recent Arab uprisings will result in a return to Palestinian organising and a revolutionary present. Rema Hammami still lives in the shell that remains of her beloved Palestine. Born in Saudi Arabia, Hammami grew up in Jerusalem, Britain, Belgium and the US and in 1987 returned to live in Jerusalem. A professor of anthropology, she settled in Sheikh Jarrah where most of her fellow residents were ‘surviving remnants of a more genteel past’- mostly spinsters and widows from good families who had died or moved away. Rarely did she encounter a nuclear family, let alone a child. She commutes to Gaza for her fieldwork – a trip only made bearable by her return to this strange haven in east Jerusalem. Hammami describes the Second Intifada in 2002 as bringing about the ‘annihilation of our familiar links between time, place and matter.’ The regular trip to Gaza became impossible when flying checkpoints were thrown down just below her home – all part of the settler plan for her neighbourhood that would soon include the eviction of 500 Palestinians and the building of 300 settler homes in their place. But it is also about the resilience of those who have ‘remained in place’, as novelist and poet Mourid Barghouti discovered when he hired a driver to take him to Jericho. In The Driver Mahmoud Barghouti takes a trip in a yellow taxi and in order to dodge Israeli tanks, circumvent closed roads and evade ubiquitous flying checkpoints, his driver Mahmoud crosses open fields, becoming mired in mud along the way, in order to deliver his disparate passengers. Mourid Barghouti has been living away from his fellow passengers, his countrymen and women, and finds their light approach to the plans of the ‘terrifying individual such as Sharon’ incomprehensible. When Mahmoud announces that the anticipated attack will come tonight his fellow passengers are not particularly upset. ‘Everyday they kill us retail, and once in a while they get the urge to kill us wholesale’ says one of the passengers. Barghouti says that for the inhabitants of these Palestinian cities, ‘everything has become food for jokes’. It may be quite correct to assume that most poets and novelists could not lead such a perilous expedition but then that is not their role. Instead their task is to write and in doing so teach, inform, enlighten and entertain. 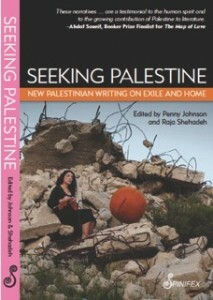 A role beautifully fulfilled in this fine collection of new Palestinian writing on exile and home.